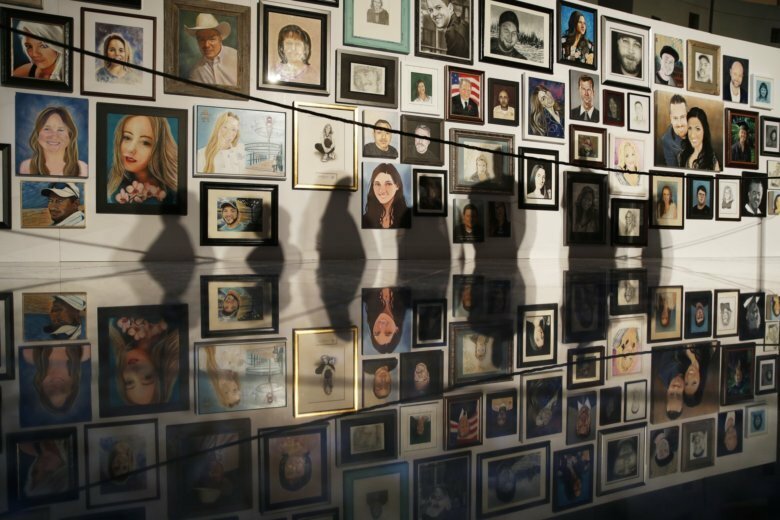 LAS VEGAS (AP) — Families of some of the 58 people killed in last year’s mass shooting in Las Vegas met Thursday night with artists who spent days, weeks and months staring at pictures of their lost loved ones, trying to capture their likeness. The emotional reception at a Clark County building in Las Vegas came after family and friends of the victims spent much of the week at memorials and other tribute events marking the anniversary of the Oct. 1, 2017 shooting — the nation’s deadliest mass shooting in modern history. The reception, which featured therapy dogs, live music and counselors, drew at least 17 of the 58 participating artists, who came from as far as Australia to attend the event, Clark County Commissioner Susan Brager said. Last year’s shooting occurred at the end of a three-day country music festival on the Las Vegas Strip, when a gunman in a tower suite at the Mandalay Bay hotel-casino opened fire on the crowd. In addition to the 58 people who were killed, hundreds were injured — including more than 400 who were shot or had injuries from shrapnel. “All of our worlds were rocked by this tragic situation,” Kortney Struempf of Marietta, Georgia, a co-creator of the portraits project, said Thursday. Struempf said it was hard to find the words to express what happened, but the art offered a way for talented strangers “to try to build a bridge of hope and healing” for the families. Roth had survived the shooting herself and made her first trip back to Las Vegas this week to attend the reception — and meet McIldoon’s family. Roth painted McIldoon while listening to country singer Eric Church — who performed early on at last year’s festival and was a favorite of McIldoon’s. Roth said painting him helped her heal, process the trauma she experienced, and reminded her to never take life for granted. She had spoken on the phone with McIldoon’s mother, Angela McIldoon, but didn’t meet her until Thursday night, when McIldoon wrapped her arms around Amanda as they posted for picture in front of her son’s portrait. “It just means so much to us,” McIldoon said, declaring the portrait a “perfect likeness” that even included a small scar on her son’s eyebrow. The paintings will be on display for a month before they are given to the families later this October. McIldoon said she loves that so many people are coming by the gallery where the portraits are displayed and seeing her son’s face — and the others who were killed that night.